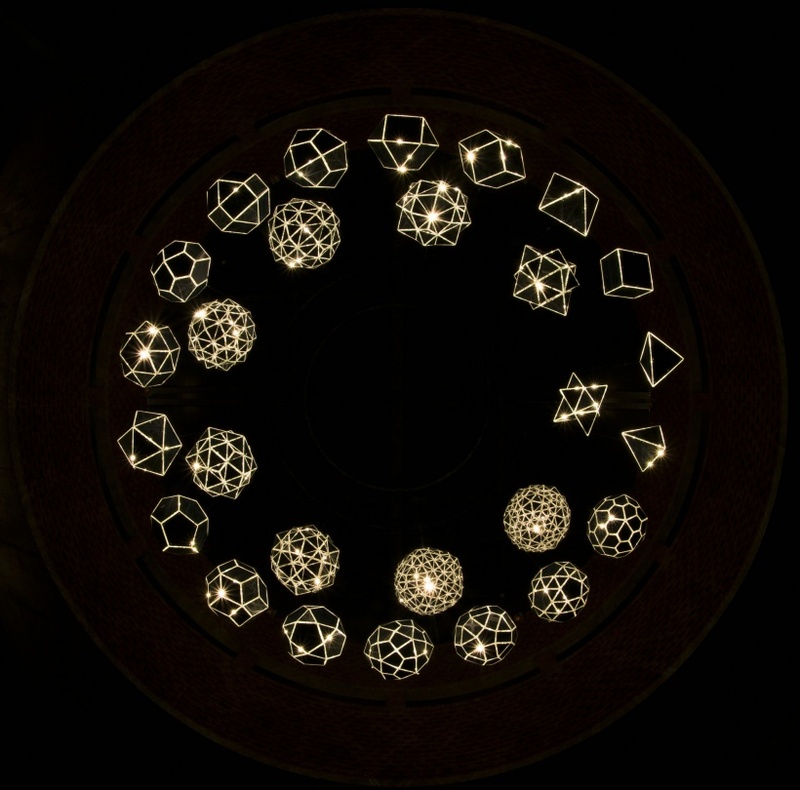 Your Sound Galaxy, 2012, is a group of twenty-seven polyhedra suspended from the ceiling and arranged in two horizontally concentric circles. The polyhedra are arranged in a clockwise sequence in which each form has more faces than the last, leading up to, but never reaching, a sphere. Each form is made of a stainless steel frame clad in mirrored glass that is turned inwards, so that the mirrors’ blue-grey versos act as the faces of the polyhedron. 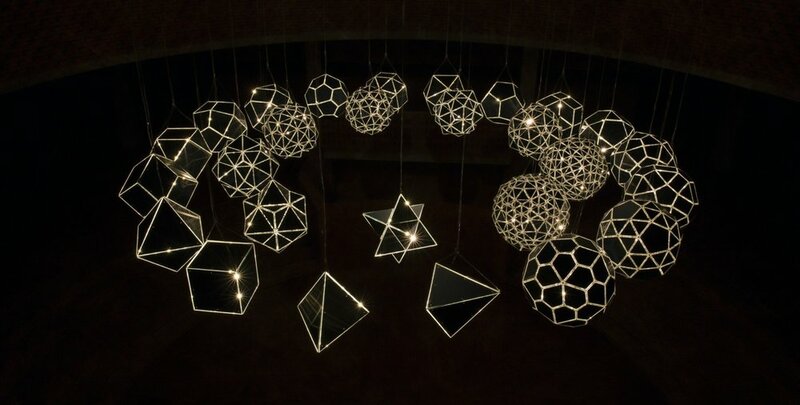 A single halogen light bulb mounted inside each polyhedron is multiplied by the reflective interior into a twinkling glow that escapes through the gaps in the frames and gives the sense of a universe contained within. The twenty-seven polyhedra are organisable into nine ‘families’ of three related forms, in which two of the three are so-called dual polyhedra – meaning that the vertices of one correspond to the faces of the other – and the third, hanging in the inner circle, is created by combining the other two. For example, an octahedron, made from eight equilateral triangles, is combined with its dual, a cube, to form a cube-octahedron. An example of a more complex combination is the pentagonal icositetra–snub cube: the fusion of a polyhedron with twenty-four faces, known as a pentagonal icositetra, with a snub cube, which has twenty-four vertices and thirty-eight faces (six squares and thirty-two equilateral triangles). The title of the work relates to the theory laid out in Johannes Kepler’s The Harmony of the World that the universe is organised according to the rules of musical harmony, where each object in space constitutes a sound, although this sound is not audible. This belief extends as far back as Pythagoras, who, legend has it, theorised that the movement of the planets and stars follows mathematical laws and proportions that correspod to musical notes. Seen in this light, each polyhedron in Your sound galaxy can be understood as a kind of celestial body in a universe that is not chaotic but logically structured. A weathered piece of driftwood is encircled by a framework of thin steel rods that holds small cylindrical magnets. This framework’s profile, when viewed head-on, presents an eight-pointed star, and the cluster of magnets aligns the work along the north-south axis. The driftwood itself was harvested from a beach on the north coast of Iceland, where it arrived after drifting for years from Siberia via the north pole. The lost compass is an example of Eliasson’s ongoing exploration of tools for orientation and methods of mapping space. The central component of each of these simple optical instruments is a ring of bevelled glass. Originally part of a Fresnel lens, the glass was designed for use in a lighthouse to gather stray beams of light and send them out at a consistent angle, thereby enhancing the light produced. Here this ability to treat light as a malleable material is used to paint bands of pale colour on the wall. From the beginning of his career, Eliasson has been interested in producing artworks that function as experimental set-ups; these works are examples of this approach. This group of watercolours was produced using chunks of ancient glacial ice that were fished from the sea off the coast of Greenland. The ice was placed atop thin washes of colour on a sheet of thick paper. As the ice gradually melted, the resulting water displaced the pigment, producing organic swells and fades of colour. 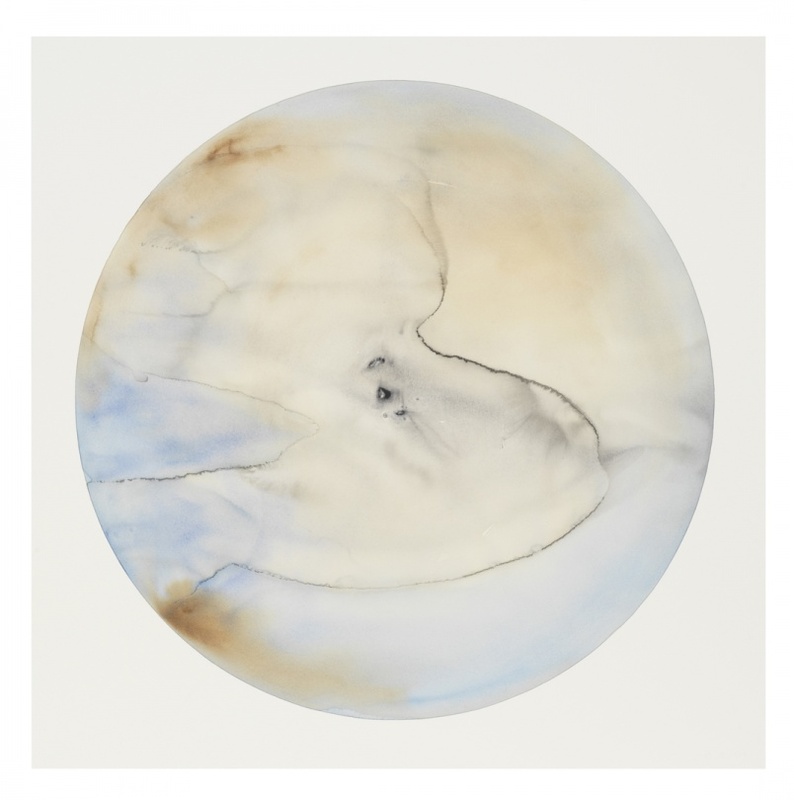 Employing chance and natural processes, these watercolours are experiments that attempt to utilize the spontaneous behaviour of natural phenomena as active co-producers of the artwork. Watercolours are a significant part of Eliasson’s artistic practice, since 2009 he has used this medium to investigate colour, movement, and space. Created in 2010, Water Pendulum as Red Brick Art Museum’s newest acquisition will be presented in Gallery 2 . 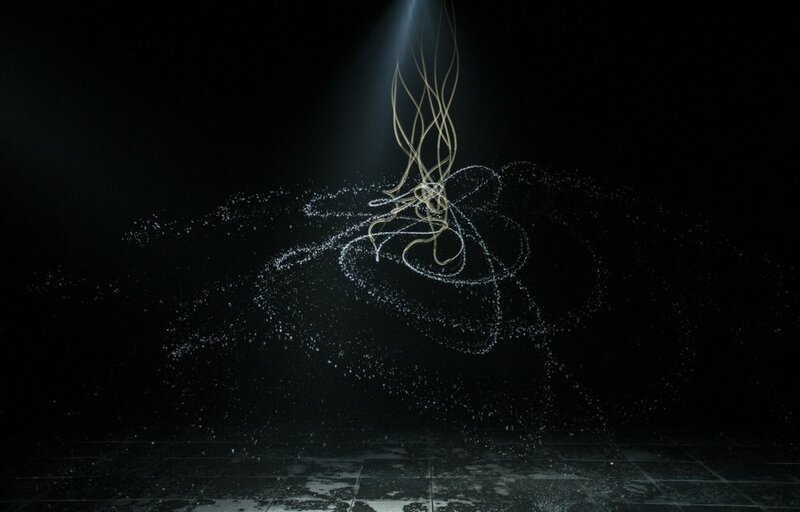 A running hose hangs down from the ceiling in a dark room illuminated by a strobe light. The strobe light makes the water appear solid, like glass. The pressure from the hose causes the water to whip wildly around the room, and one can only capture the water’s trajectory in fractured glimpses. This unpredictability is materialized as physical discomfort linked to a bodily expectation of pain. The work is visually appealing, but we cannot trust what we see. Chopped into little glimpses of light, the work is experienced abruptly and erratically. A large ring seems to cross the boundary between physical space of the room and the room’s reflection in a vast mirror that covers the ceiling. The light emitted by the ring, produced by monofrequency lamps, reduces all colours to a range of yellowish grey tones that sharpens viewers’ visual perception. These lights, often used to illuminate tunnels for enhanced safety, appear in many of Eliasson’s works, including The weather project at Tate Modern, London, in 2003. A circular curtain of mist inside a darkened space is illuminated from within by a ring of spotlights that cause shimmering rainbows to appear on the circle’s inward-facing side. 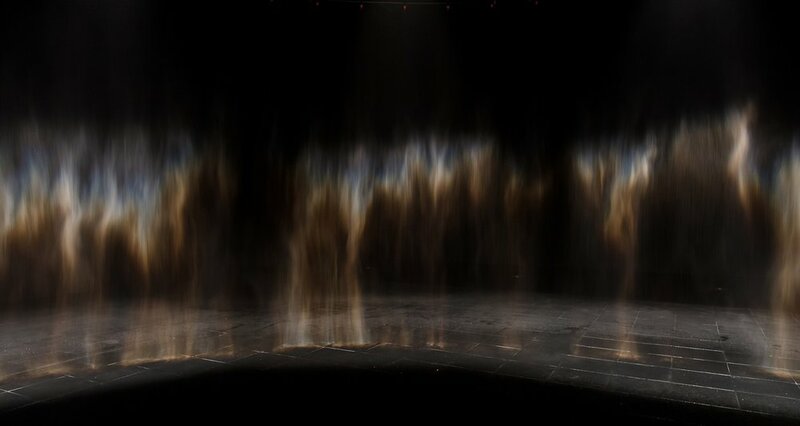 The shimmering colours visible in the curtain of softly falling water are not present in the mist itself, but are seen there when rays of light are refracted and reflected by the droplets of water and meet a viewer’s eye at a particular angle. The work is thus incomplete until someone comes along to close the circuit by moving into a position from which the colours can be seen. Eliasson’s works depend on the viewer’s engagement; the artist makes frequently use of phenomena like reflections and afterimages that are absent in the artworks themselves but produced when the artwork is viewed. 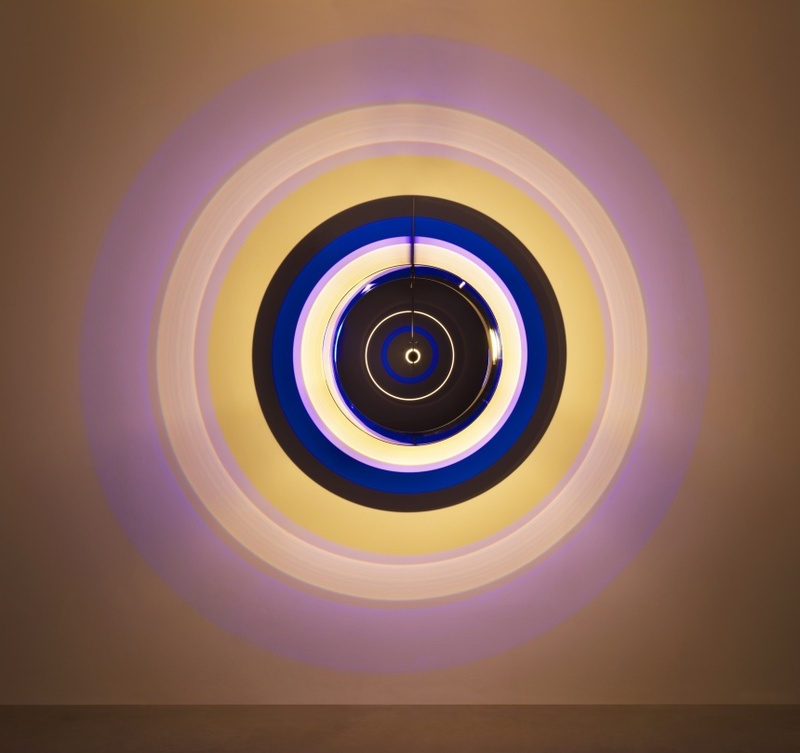 This work is an evolution of one of Eliasson’s most important early works: Beauty, from 1993. Two half-elliptical red mirrors meet at a corner to form a single ellipse that is bent at the angle of the two corner’s two walls. These mirrors reflect each other, producing the image of a second ellipse within the virtual space. Eliasson works with mirrors to open up virtual expanses within the physical space. These works frequently employ forms that, when seen together with their reflections, produce the illusion of single objects that appear to traverse the boundary between the actual world and the mirror-world, giving rise to the impression of a single continuous space. Together, the works form a progression of ellipses that increasingly diverge from circular, creating the impression of a set of rotating discs. Acquired by Red Brick Art Museum in 2012, The Blind Pavilion premiered at the Danish Pavilion in the 50th Venice Biennale. 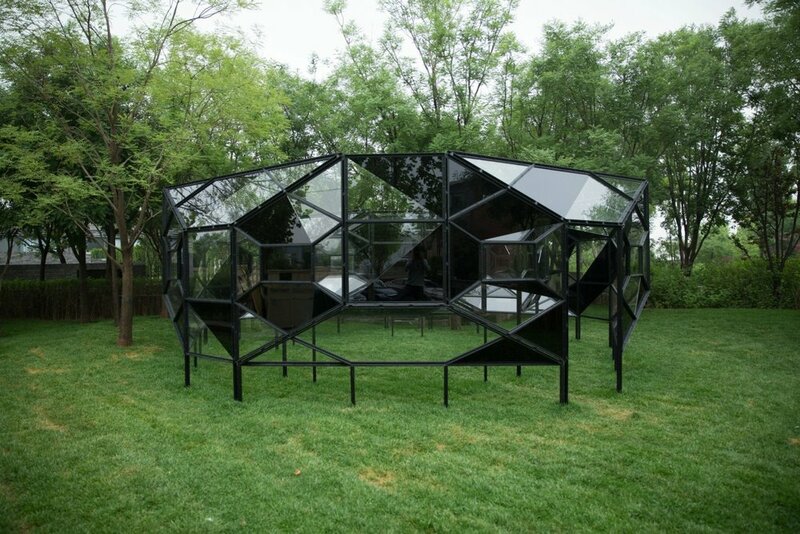 Based on the principle of central perspective geometry, the artist inlaid 148 irregular black glass panes with 149 polygonal transparent glass panes in a double-clad metal structure. The reflections and perspectives of a kaleidoscopic arrangement of the glass surface enhance the viewer’s visual and physical experience. 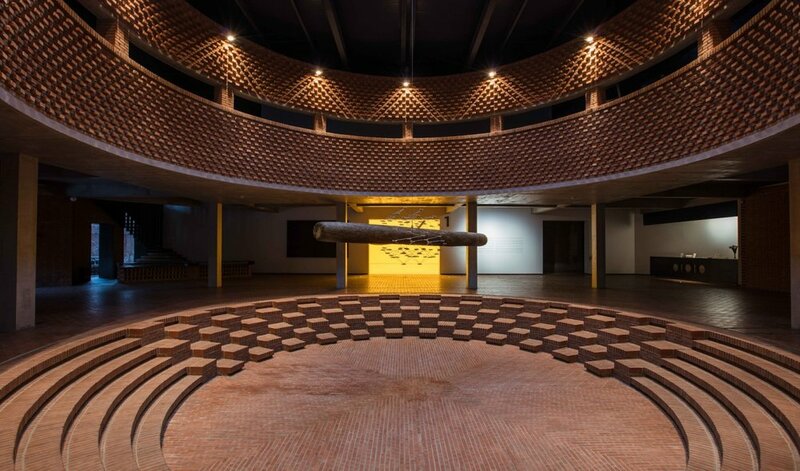 Eliasson visited Red Brick Art Museum in 2014 prior to its formal inauguration. After consulting the museum, the artist decided to move The Blind Pavilion from its original site in the museum lobby to its current location in the garden area. The move not only restored the initial quality of the work being part of nature, but also provided more dimensions to the “perfectly blinded view” as the light, climate and seasons change. As Yan Shijie observes, “Like the leader of a think-tank, Eliasson uses art to protect, vocalize, and inspire consensus and action from the perspective of climate and civilization. He navigates the depth of time, changing light and shadow, advocates dialogue between man and nature, and practices the philosophy of harmony between heaven and humanity. Every piece of work by Eliasson is carefully presented in this exhibition to reveal new tension and dimensions to the artist’s oeuvre. He may have one hundred ideas for a piece of work, and then delete them one by one. In the end, there may be only one pure essence left. We tried to perfectly combine the spaces of the Red Brick Art Museum with the energy released from the works of Eliasson; to display an art scene with a profound dialogue between the work and the space. When the viewers enter the exhibition and immerse themselves in the experience of science and technology, the works provide them with heightened sensations and awareness.” (Words and Images via Red Brick Art Museum).